For all the people that say Disney is for babies, I'd like to put together a discussion about Disney's Deepest Darkness. Let's see how many Disney's darkest moments we can remember. My suggestion is a classic Mickey Mouse short the Mad Doctor, which was so creepy it was banned in the UK. The whole point is to simply remember Disney's darkest moments. That one opinion about Disney being for babies just gave me an idea to start a new topic. It's like a chain of thoughts. idk if this is even the right forum, since it has nothing to do with KH at all. and these are just the disney villain's fates. mufass was trampled to death, tadashi was blown to bits, i am going to avoid touching UP completely because of the emotions. Early Disney films were even darker, unnecessarily so sometimes. Bambi got dark even excluding the mom being shot and the clashing cutesy fawn and romances scenes. I won't even start with Pinocchio. 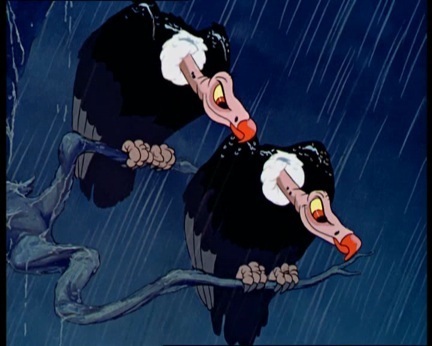 Seriously, this still creeps me off whenever I watch Tarzan. I sometimes wonder if so many worlds fell so quickly before KH1 because they all had disturbingly large amounts of darkness to begin with. they put extra emphasis on the gate below and panned the camera away right before he hit it. i imagine its similar to what ra's al ghul's death scene looked like in BAC. Holy sheesh, that's dark. And they say Disney is for babies. honestly you are the first person who i've ever heard that from. you must know some real chumps. I know, right? I'm just so unlucky, and those "chumps" won't even listen. tell them ol' chuman will fistfight them, while dressed as tron and sniffing user blood. didn't he just fall straight into a ravine below the castle's bridge? oh okay i guess i misremembered that. thanks for the clarification. that's still pretty dark. Classic Disney shorts such as Mad Doctor and Runaway Brain were pretty dark too.